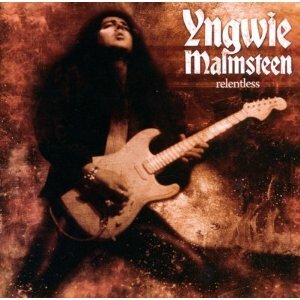 Hall of the Mountain King: Review: Yngwie Malmsteen, "Relentless"
I was a little disappointed with Yngwie Malmsteen’s last outing Perpetual Flame, primarily because of the underuse and uninspired performance of vocalist Tim “Ripper” Owens. It was a combination I had high hopes for. Malmsteen’s latest outing, Relentless, doesn’t correct the underuse factor, featuring Owens on only six of the 15 tracks, but it does correct the uninspired portion. The shift comes early on the first tune to feature vocals, “Critical Mass.” Malmsteen delivers an incredibly catchy Persian-flavored guitar riff and Owens gets a vocal line that not only is much more interesting than the generic melodies from Perpuetual Flame, but is one of the best lines he’s had since his departure from Iced Earth. “Enemy Within” opens with some Gregorian chanting and then delivers a bashing riff and a great vocal that on the chorus finds Owens slipping into kind of a chant melody himself before exploding in the loud, piercing shrieks that first earned him the gig with Judas Priest. It’s very reminiscent of his work on Iced Earth’s Framing Armageddon, and it’s one of the strongest pieces on the record. “Caged Animal” has a nice rhythm guitar groove and an old-school traditional metal feel, as does “Axe to Grind.” I particularly like the chorus on the latter track. It’s simple, but catchy. “Tide of Desire” is more of a classic Malmsteen tune that wouldn’t have been out of place on his early albums, but there’s a more aggressive edge, heightened by Owens’ vocals. “Caged Animal” has a nice rhythm guitar groove and an old-school traditional metal feel, as does “Axe to Grind,” the final song to feature Owens. I particularly like the chorus on the latter track. It’s simple, but catchy. Malmsteen also steps up to the microphone again on “Look at You Now,” which, just as it was when he tried vocals on Perpetual Flame, is a real mistake. For all his talent as a guitarist, he has no ability as a singer. This performance is better than the one on the last record, but it’s still a head-shaker considering that he has Owens at his disposal and it seems to be a tailor-made song for his voice. The rest of the record, as is often the case with Malmsteen, consists of him showing off his fleet fingers on the scalloped fretboard of his Fender Strat. As always, the neo-classical licks and runs that he delivers are always impressive and often mind-boggling, but at least for me, there’s only so much of that I can take. Once the wow factor wears off after a couple of listens, I find myself skipping most of the instrumentals and going back to the tunes that feature Owens. “Into Valhalla” is probably the most memorable with some more chanting and a chugging bass riff, also played by Malmsteen. There’s even a nice homage to Ozzy Osbourne’s “Diary of a Madman” slipped in. Whether it’s intentional or not, I don’t know, but I sort of doubt it. The six songs that feature Owens on vocals are some of the best work that Malmsteen has recorded in a very long time. They’re all complete, well-constructed songs, rather than simply vehicles for Malmsteen to show off his shredding skills. Unlike on Perpetual Flame, Owens seems inspired and energetic on these tracks, and “Critical Mass” and “Enemy Within,” in particular, deliver exactly what I’d hoped for from this pairing. I only wish there had been more moments on the record like this. The rest, for the most part, is self-indulgent wankery. Of course, what else do you expect from Yngwie? Relentless is the first Malmsteen record in quite a while that I expect I’ll return to regularly as time goes by. This record was purchased by the reviewer.